Rolf Suey - Better Late Than Never: Elon Musk - The real Tony Stark (Iron Man)! Couldn’t get to sleep last night, and come across a video interviewing a guy called Elon Musk. 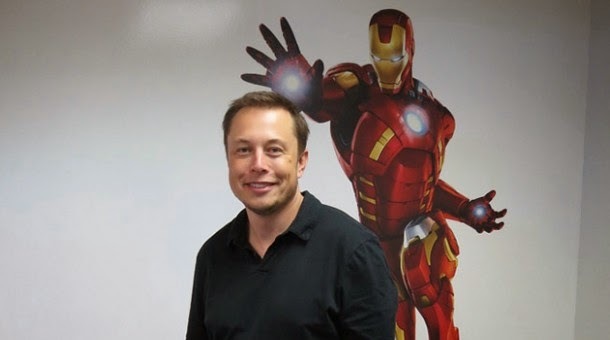 This guy is the Tony Stark (Iron Man) of real life, engineering incredible inventions combining with great business sense. He is made famous from Paypal and Tesla Motors. For those who have not yet heard about Elon Musk, he is probably going to have much more influence than Bill Gates (Microsoft), Warren Buffett (Berkshire Hathaway), Steve Jobs (Apple) or Mark Zuckerberg (Facebook) etc to the history of mankind. Elon Musk is born 1971 in South Africa and later had his education in Canada and America. He is Entrepreneur, Inventor and Investor. After dropping out of Standford PHD-Energy Physics, two days after admission, Elon Musk started Zip2 Corporation which is an online city guide for newspapers. Zip2 was sold to Compaq for $307m in 1999. Musk earned $22m from the sale and become a millionaire at age 28. Elon Musk is more widely known for his involvement in Paypal as one of the founders and main driver of the company. Paypal is the online internet payment company which was eventually sold it to eBay for $1.5b in 2002. Elon Musk pocketed $165m from the sale. While Steve Jobs or Mark Zuckberg revolutionized ways of how a person communicates, Elon Musk is definitely more than that. Having already conquered the cyberworld after building Paypal, Elon Musk started working on Renewable Energy and Space Travel, affecting mankind in a greater magnitude. After Paypal, he started SpaceX, a non-profit company that develop rocket technology, in his dream for mankind to be able to travel to-and-fro other planets in space and live there one day. The key for the success is to make Rockets re-usable. Musk is also the founder of Tesla Motors, the Electric Car company listed on Nasdaq whose share price rocketed from $30 to $200 a share, since 2013. So why an Electric cars? Electric cars use battery and are more efficient in utilizing energy compare to gasoline combustion. It means less energy consumed for the same distance traveled. Moreover electric cars reduce carbon emission, making it more environmentally friendly. The key to Tesla success is the ability to make the battery pack for electric cars cheaper, smaller and lighter so that the car can travel a longer distance. The price for Tesla two current models, Roadster is priced at $109,000 and Model S is selling at $57,400, and the company plans to later launch a $30,000 vehicle. Elon Musk is also the chairman of SolarCity who he reckoned solar energy will be the biggest source of energy for mankind in future. Last year, Musk also unveiled a proposal for a new form of high speed travel rail system using partial vacuum to reduce aerodynamic drag, and relying on solar energy for power requirements. For more details on Elon Musk, please refer to his biography here. After reading and watching videos on Elon Musk, this "Iron Man" had gained my respect and admiration. He is not only clever, but extremely humble in his interviews. He also worked extremely hard averaging 80-100 hours a week, and once came close to a nervous breakdown. The only downside is probably his poor management in relationship. He had five children. Imagine calling your family and friends from Mars one day?